Wes Johnson was looking to hitch a ride in Monson to the trailhead. MONSON, Maine — For thru-hikers on the Appalachian Trail, there is a phenomenon known as “trail magic.” As a rule of serendipity, it arrives when it is most needed, when the hikers are beat, downtrodden, lonely, hungry. When the weight of their pack and the miles ahead of them are crushing their will. That’s when trail magic happens. Maybe they turn a corner in a remote section of woods and find a cooler, just sitting there on the path, filled with Coca-Cola and beer and sweets and fresh fruit. It is a sign of respect from a stranger, a nod of appreciation for this grand thing the hikers are attempting to accomplish — to walk the entire 2,184-mile trail from Georgia to Maine in one year. Trail magic regularly reduces hardened woodsmen to tears. Deep in the woods of central Maine, there is a tiny, don’t-blink-or-you’ll-miss-it town of just under 700 people called Monson. Thanks to an accident of geography, Monson found itself positioned at a pivotal point on the Appalachian Trail when it was completed 75 years ago this summer. Monson is the last town the trail passes through for those hiking north, or the first for those hiking south. Either way, thru-hikers arrive in Monson in desperate need of some trail magic. And they get it. For generations, the people of Monson have met their geographic accident with legendary altruism. They are famous up and down the trail for opening their homes, their cars, and their wallets to hikers in need. It is a town full of trail angels. Her role in life, she believes, is to be “a port in the storm and get the Appalachian Trail hikers where they’re going.” Because of Monson’s unique location, they often need a lot of help. In 1937, workers from the Civilian Conservation Corps cut the final two miles of what was then the longest marked walking path in the world, stretching from Springer Mountain in Georgia to Mount Katahdin in Maine. It was envisioned as a grand trail through the Appalachian Mountains, connecting mountaintop work camps where city-folk could go to toil and recharge in the natural world. The work camps never happened, but 11 years later, a young man fresh out of the Army named Early Shaffer accomplished a feat that even the trail’s founders thought impossible: he hiked the entire thing. Each year, between 1,000 and 2,000 people attempt to copy Shaffer’s feat, to walk all 5 million steps. Only between 10 and 25 percent make it. Many quit at the first opportunity. For those who are heading southbound from Mount Katahdin, that first chance to quit is Monson. Monson is situated 114 miles down the trail from the northern terminus at Mount Katahdin, at the foot of something called the “100-Mile Wilderness.” Cruelly, and perhaps fittingly, it is considered by many hikers to be the most grueling stretch of the entire trail. It is certainly the most remote. There are no resupply points in the 100-Mile Wilderness, which means hikers must carry as much food as their backs can handle — on top of 25 to 70 pounds of gear. The remoteness is magnified, in a modern sense, by the fact that it is the longest stretch without a cellphone signal. For southbound hikers, the 100-Mile Wilderness can be traumatizing. They don’t have their trail legs under them yet, and they have come to the realization that they had no idea what they had gotten themselves into. Often, they have been out of food for days. When they get to Monson, many want out, beg for a ride to Bangor, 57 miles away, so they can get on a bus or a plane and leave this entire mistake behind. These people are Anderson’s specialty. Take off your boots, she will say. Take a shower. Put on some clean loaner clothes. Eat something. Eat everything. 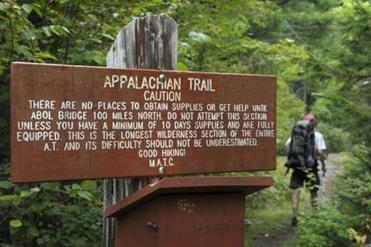 Take a “zero day” — the Appalachian Trail term for a day where they don’t log any trail miles — and think about it. Being a “hostel momma” is not an easy job. She spends her life cleaning bathrooms that are dirtier than dirty. Hikers arrive at all hours, and if her 11-year-old daughter, Bella, comes along to pick up a hiker at the trailhead three miles north of town, she will demand a new air freshener. Hikers smell like the zoo. There’s almost no money to be made; a bunk runs $25 a night, but many stay for free in exchange for a couple hours of chores. She regularly ignores declined credit cards, gives supplies to those who have none. They are “smelly, Sasquatch-looking people,” but she knows they could be anyone — CEOs or college students, empty-nesters or divorcees — and Anderson considers it a supreme responsibility to recognize their individual accomplishment. And then she wants to make sure they walk out of Monson. On Labor Day weekend, Anderson picked up a southbound hiker, a young man named Alex who had just come out of five years in the military. 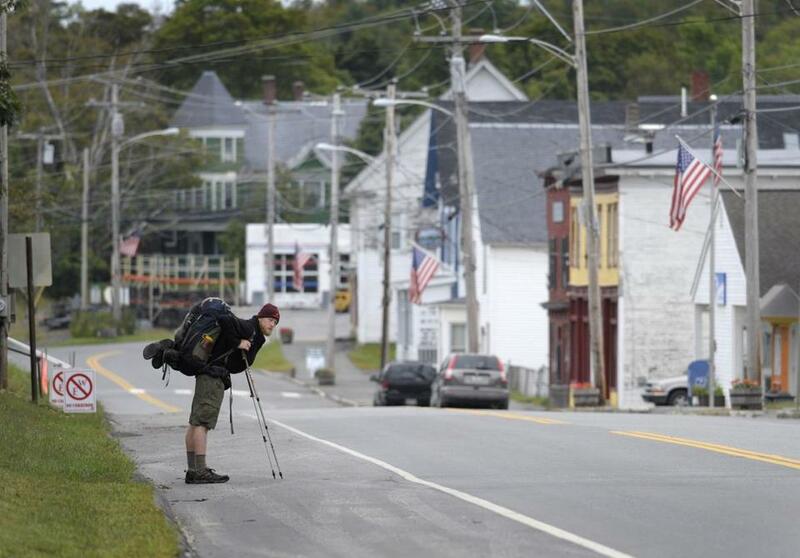 There are a lot of Iraq and Afghanistan veterans on the Appalachian Trail; it’s known as “walking off the war.” In Monson, they still see many trying to walk off Vietnam. Alex had been defeated by the 100-Mile Wilderness, swore it was infinitely harder than anything he’d done in the military, and desperately wanted a lift to Bangor so he could quit. After a double zero under Anderson’s care, he walked out of Monson, on his way to Georgia. Monson, Maine, is located near the Appalachian Trail’s most remote section, making the town crucial for thru-hikers. Today, MacPherson-Allen and her partner, Susan Stevens, run Shaw’s, the most famous hiker hostel on the entire trail. Shaw’s began in 1977, just as thru-hiking was becoming popular, when a man named Keith Shaw turned his boarding house into a hiker hostel after seeing some thru-hikers walk by, looking a mess, and took them in. With Shaw’s as a trusted stop, Monson took off as an Appalachian Trail town. Shaw’s is famous for its breakfast. It is an iconic part of the AT experience. Hikers dream about it, wonder if they will ever taste it. In its 35 years, Shaw’s has fed 100,000 hikers – including many “section hikers” who spend years or lifetimes trying to walk the entire trail in a piecemeal fashion – and it is perhaps the best place to see the legendary hiker appetite in action. “The central feature of life on the Appalachian Trail is deprivation,” the humorist Bill Bryson wrote in “A Walk in the Woods,” a best-selling book about his failed attempt to thru-hike the trail. When hikers get near food, look out. The southbound hikers will eat, for sure. But the northbound hikers are a different animal. By the time they reach Monson, they have walked more than 2,000 miles already, and the trail has eaten away their body fat and is starting to take muscle. Late summer and early fall are the peak times for northbound hikers to hit Monson; most start in Georgia in early spring, and it takes about four to six months to get to town. This makes the $7 all-you-can-eat breakfast at Shaw’s a thing to behold. The menu is simple: bacon, sausage, eggs, homefries, and pancakes. And hikers order with a number: How many of each do you want? Many answer with a question: What’s the record? One guy went to 11. Northbound hikers have gone through a transformation on the trail. They are very often zen-like, nonverbal, having spent so much time in nature, in their own heads, away from the real world, away from human contact. But hostel owners are symbols on the trail: they are safety. Stiffler is 46, prefers to call himself a “trail head,” and seems to carry a cloud of fun around with him the way the hikers carry a cloud of dirt. His self-assigned role in life is to turn “zero days” into special days for the hikers. He’ll give them rides, take them to a local swimming hole to jump from a 30-foot cliff, let them crash on his couch, feed them, resupply them, and make sure they leave Monson feeling more than rested. He wants them to feel inspired. Trail angels in Monson lead a strange existence. They go through very brief, very intense relationships with people who are at their most vulnerable, their deepest. And then, most of the time, they never see them again. But there is always another one right behind them. This is Ponytail Paul’s life. And like most trail angels in Monson, his altruism comes with benefits. The hikers have inspired them. In four years, when his youngest son is in college, he’s planning to copy them. He’s going to thru-hike the trail, climb Springer Mountain in Georgia, put his head down and start walking. He wants what the hikers have. He wants to arrive in Monson and feel like he’s earned it. And rather than supply the trail magic, he wants to feel it. Billy Baker can be reached at billybaker@globe.com.